Social CRM is the strategy that underlies how you interact with your customers. Quite naturally, we all want to make our customers feel special. If you want to do that today, you have to really understand how social media has forever changed how you interact with your customers. If it isn’t yet resoundingly clear why social media isn’t just a new communication channel, let’s stop to take a quick lay of the land. The Pew Research Center, a leading nonpartisan Washington, D.C.-based think tank, has compiled the data and computed the results. 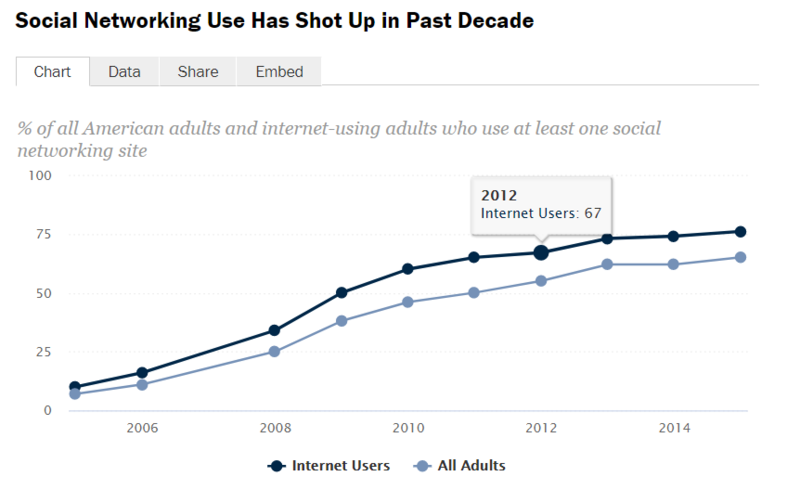 Eons ago back in 2005, social media adoption rates were a measly 5% of all internet users. By 2015, adoption rates had soared to 65 percent (Chart 1 below). Additionally, the 2018 Digital Yearbook tells us that as of January of this year Facebook has 2.2 billion users worldwide. Looking at this research I would argue that it is by no means a stretch of the imagination to believe that Instragram with 800 million users will surpass 1 billion users within a few years (Chart 2 below). Social media is disruptive. It has fundamentally changed how businesses interact with customers. Of course, what is most obvious is often times what is most difficult to see. It’s been the visionaries who have had the foresight to recognize how game-changing social media is. At this point, it is important to clear up the distinction between CRM and the technologies (software) that support it. The idea of CRM is really about a strategy that companies employ, often times with supporting technology and processes, to manage customer relationships. Under the traditional model of CRM, communication took place over one-to-one channels (phone, mail, email) between a company and its customers, and in many cases over one way channels such as through television and print media. But the rise of social media has upended this way of conceptualizing CRM. The fact that companies now interact with customers that are plugged into social networks is important. It tells us that customers are now in the driver’s seat within the public domain when it comes to representing your brand. Companies need to adapt to this substantial change. Social CRM is the strategy that defines how you engage. One of the key issues highlighted in the article deeply resonates with the very notion of Social CRM, namely that today customers are now “driving the conversation.” As the article points out, customers are free to comment on L.L. Bean’s apparent lack of diversity or failure to remove an individual from a mailing list. At the same time, even back in 2011 customers were turning to social media to ask simple questions regarding the company’s hours of operation. In fact, in 2011 L.L. Bean “recorded 50,000 social media mentions on Twitter, blogs, Facebook and Youtube.” Clearly, for L.L. Bean, Social CRM entailed providing customer service over social media. As we look forward to the years ahead it’s important that we recognize that certain trends – such as the exponential adoption of social media across the globe – have changed the way business is conducted. The visionaries have been those companies, like IBM and L.L. Bean both of whom recognized the need to employ Social CRM. In the years ahead we can reasonably anticipate that Social CRM’s importance will continue to rise. Staying ahead of the curve is one thing – getting left behind is another.